Motorcycle Accident Claims Guide – How Much Compensation Can I Claim? Do you want to secure compensation for being knocked off a motorcycle? If you have been injured in any sort of motorcycle accident, it is likely that you will be entitled to compensation if the incident was not caused because of your mistake. At Accident Claims, we have helped many people to secure compensation for such incidents. You can reach us on 0800 073 8801. However, before calling, please read on to discover everything you need to know about motorcycle accident claims. Do You Have A Motorbike Accident Claim? What Can You Claim For When Making A Motorcycle Accident Claim? If you have been injured in a motorcycle accident claim that was not your fault, it is important to get the compensation that you deserve. In this guide, you will discover everything you need to know about doing exactly that. You will find information on motorcycle accident compensation examples, as well as the steps you should take if you have been involved in a motorbike accident. You will also get an understanding regarding the motorcycle accident injury settlement you may receive. According to a report that was published by the UK Government in June 2015, there were 5,197 people that were seriously injured or killed on motorbikes in 2013. Moreover, rural roads were clearly the most dangerous. Despite these roads only accounting for 40 per cent of all motorbike traffic, they account for 68 per cent of all motorcyclist fatalities. When it comes to making a claim for a motorbike accident, no matter how you have sustained it, the most important thing is being able to prove that someone else caused your injuries. For example, you must show that the other driver is responsible, either by being on their phone, driving carelessly, or something different. Of course, it is not always a driver that is to blame. It could be the council for poor road upkeep. Aside from this, the accident must have happened in the past three years. This is the time limit on most personal injury cases, and it is very strict. You should not leave it too long, as court proceedings must be issued within this time frame, and the longer you leave it the more difficult it will become. If you believe that you are partly to blame for what has happened, you may still be able to secure compensation. Nevertheless, the amount will be lower due to the fact that you have had a part to play. The best thing to do is give us a call for more information on this. Take photographs – If there has been any damage to the street or your motorbike, you are advised to take photographs, as this will help to strengthen your claim. You should also take photos of your injuries if they are visible. Acquire contact details – You will firstly need the contact details of the person that caused the accident. This includes their basic contact information, the details about their vehicle, and their insurance information. You should also try and get the contact information of anyone that witnessed the incident, as this can also help you to build a strong case. Contact the police – In some cases, you will need to contact the police. This is especially the case if the accident is posing a threat to oncoming traffic. You should also call the police if the person who caused the accident has fled the scene. Hire a No Win, No Fee solicitor – It is always better to go for a No Win, No Fee This is because you won’t have to pay the legal fees if they do not secure compensation for you. This ensures the risk that is typically associated with making a motorcycle accident personal injury claim is eradicated. This also leads to a better service too because the solicitor is going to be accountable for the service they provide. At Accident Claims, all of our solicitors are No Win, No Fee. Keep proof of all costs incurred – You will be able to make a claim for any expenses you have suffered as a direct consequence of the accident you were involved in. Common examples include travel costs, motorbike repair expenses, loss of income, prescription expenses, the cost of treatment, counselling expenses, and such like. In order to claim for these, however, you are going to need proof, such as receipts. Make a note of everything that happened – It is always advisable to sit down and make a note of everything that occurred. This will make sure you do not overlook any important details later on down the line. If you have been involved in a motorcyclist accident with an uninsured or untraced driver, you can still make a claim for compensation. The way in which the case is launched will be different because you will be claiming via the Motor Insurers Bureau. This is something you do not need to worry about, though, as we can handle this for you. The MIB was established to make sure that victims of untraceable or uninsured drivers were still able to secure the payout they deserved. Drivers who do not check blind spots and their mirrors when they are turning right or changing lanes are at serious risk of causing severe accidents and colliding with motorcyclists. The ‘mirror, signal, manoeuvre’ method is required when changing lanes or turning right. This means that drivers need to check for other traffic in their mirrors, signal their intention to move right or change lines, and carry this out in a safe manner. If the motorist does not follow the correct approach, he or she is putting others on the road at risk. If you are injured due to such negligence, you can make a claim. You simply need to show that the driver pulled out into your path and that your injuries were caused as a consequence of this. Making motorcycle accident claims is easy with Accident Claims. All you need to do is give us a call and we will handle everything for you. We will start the process with a free consultation, giving us both the chance to ask each other questions, and we will then guide you through the claims process. We can also provide you with other motorcycle injury claim examples if needed, as well as arranging a medical appointment for you if required. Your injuries– There is only one place to begin, and this is with the fact that you can claim for the suffering you have experienced. This is something you are probably aware of. But, how do they determine how much money you will receive? Well, when you went to see the doctor, they would have put together a medical report. This report will explain your injuries, the severity of them, the treatment you have to undergo, and the impact this is going to have on the rest of your life. This will then be used to decipher how much compensation you should receive. Medical expenses– If you have been injured, there is every chance you will have prescription and treatment costs to deal with. You will certainly be able to claim for these. Loss of use– Motorcycle accident compensation payouts also cover loss of use. This means you can claim for the period of time you are without your motorcycle. Motorbike repair costs– If you have been involved in a motorbike accident, it is highly likely that all vehicles involved will have been damaged too. The good news is that you do not have to pay for the repair of your motorbike, as you can claim for this. After all, why should you have to foot the bill when you did not cause the crash? When it comes to expenses like this, please make sure you keep hold of your receipts and such like. Replacement motorbike hire– If you need to hire a motorcycle while yours is being repaired, you can claim for this as a special damage. Loss of earnings– If you have been left unable to work while you recover from your injuries, you will be able to claim for any income you have lost during this period. In most cases, you will need a letter from your employer. However, if you are self-employed, it would be wise to get your previous month’s invoices and statements together, so you can show how much you will be missing out on. Damaged belongings– You will be able to claim for any of your belongings that were damaged during the crash. 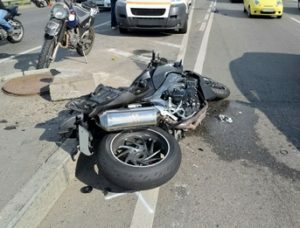 Motorbike accident compensation how much will I receive? If you want to make a claim for a motorcycle accident, you will probably want to know how much money you may receive. It is important to note that motorcycle accident compensation amounts vary dramatically. This is because all scenarios differ, with some accidents resulting in minor injuries and others having fatal consequences. When you make a claim, your case will be assessed individually and you will be awarded a fair amount based on this. You may have used a motorbike accident claim calculator online to try and get an understanding regarding how much money you will receive. It is important to keep in mind that a motorbike accident compensation calculator is only ever going to provide you with a very rough estimate. The best way to get a better understanding regarding the amount of money you will receive is to take a look at the table below. This table provides you with the average payout amounts for some of the most common injuries relating to motorbike accidents. What sort of injury have you suffered? If you cannot find the injury that you have sustained in the table above, please do not panic. You can still make a claim for compensation. If you would like more information about the payout you could receive, for example, how much compensation for broken wrist in motorcycle accident, all you need to do is give our team a call and they will happily explain further. Here at Accident Claims, our service is entirely No Win, No Fee. All of our solicitors work on this basis. What does this mean? Well, you are only going to need to pay legal fees if your case is a success, and so you are offered a considerable amount of protection in a financial sense. If you were to use the services of a solicitor that works to a different scheme, e.g. someone that charges by the hour, there is always the chance that you could spend a huge sum on legal fees and then not receive any compensation in return because your case has not been a success. For many, this is a risk that is too big to take, and we understand that, which is why we are proud to be different. This means that you can be confident of quality when you use our service. We will never waste your time; if your case is not solid enough to secure compensation, we will tell you. Not only this, but as pay is performance related, you never have to worry about our solicitors not putting the work and effort in to make sure your personal injury claim is a success. We are experienced – We have an abundance of experience. Having been established for many years now, we have successfully helped thousands of personal injury victims over the years, and so we have dealt with every possible situation. In this period, we have also worked on a huge number of motorbike accident claims. Therefore, you can be sure that we will have handled cases similar to yours many times before. We have an excellent reputation – If you read the reviews that have been left by our past customers, you will be left in no doubt that we are the best choice for you. We have an outstanding reputation in the industry, which is built on foundations of quality and honesty. We offer a No Win, No Fee service – Our service is entirely No Win, No Fee. This offers you a whole host of benefits. Firstly, you are provided with a significant degree of monetary protection because you will not have to pay any legal fees if your case is not a success. Not only this, but you can be confident that we will not waste your time. If we do not think that your case is strong enough, we will tell you. We are easy to get in touch with – All you need to do is dial 0800 073 8801. This is our legal helpline and the lines are open seven days per week. You will be able to ask any questions you have and get updates on your case. If you want to make a motorcycle accident claim, all you need to do is give us a call on 0800 073 8801. This is our personal injury claims line, and it is open 24 hours per day, seven days per week. We are one of the leading law firms in the UK, and we can help you to get the full amount of compensation that you deserve. All of our solicitors tick all of the boxes, and so you can be sure that you are in the best possible hands. Plus, our legal advice is provided free of charge and comes with no obligation to continue with our service. Not only this, but we handle all claims with 100 per cent confidentiality. If someone you love has lost his or her life due to a motorcycle accident, you can use this link to find out whether or not you can claim compensation for a fatal accident. Our guide to claiming compensation when you have been involved in a road traffic accident. This link takes you to a UK Government website for the campaign THINK!, which is all about road safety. This section, in particular, is about motorcycles.